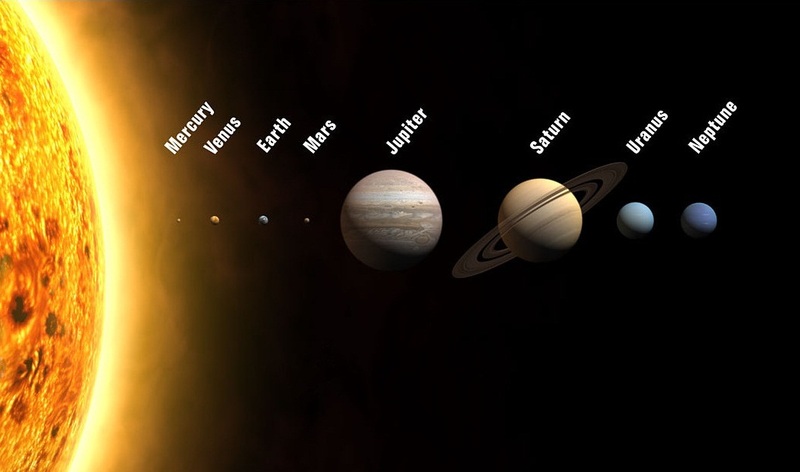 The Solar System comprises the Sun and its planetary system of eight planets, as well as a number of dwarf planets,satellites (moons), and other objects that orbit the Sun. It formed 4.6 billion years ago from the gravitational collapse of a giant molecular cloud. The vast majority of the system’s mass is in the Sun, with most of the remaining mass contained inJupiter. The four smaller inner planets, Mercury, Venus, Earth and Mars, also called the terrestrial planets, are primarily composed of rock and metal. The four outer planets, called the gas giants, are substantially more massive than the terrestrials. The two largest, Jupiter and Saturn, are composed mainly of hydrogen and helium; the two outermost planets,Uranus and Neptune, are composed largely of substances with relatively high melting points (compared with hydrogen and helium), called ices, such as water, ammonia and methane, and are often referred to separately as “ice giants”. All planets have almost circular orbits that lie within a nearly flat disc called the ecliptic plane. The Solar System also contains a number of regions populated by smaller objects. The asteroid belt, which lies between Mars and Jupiter, is similar to the terrestrial planets as it mostly contains objects composed of rock and metal. Beyond Neptune’s orbit lie the Kuiper belt and scattered disc, linked populations of trans-Neptunian objects composed mostly of ices. Within these populations are several dozen to more than ten thousand objects that may be large enough to have been rounded by their own gravity. Such objects are referred to as dwarf planets. Identified dwarf planets include the asteroidCeres and the trans-Neptunian objects Pluto, Eris, Haumea, and Makemake. In addition to these two regions, various other small-body populations including comets, centaurs and interplanetary dust freely travel between regions. Six of the planets, at least three of the dwarf planets, and many of the smaller bodies are orbited by natural satellites, usually termed “moons” after Earth’s Moon. Each of the outer planets is encircled by planetary rings of dust and other small objects. The solar wind, a flow of plasma from the Sun, creates a bubble in the interstellar medium known as the heliosphere, which extends out to the edge of the scattered disc. The Oort cloud, which is believed to be the source for long-period comets, may also exist at a distance roughly a thousand times further than the heliosphere. The heliopause is the point at which pressure from the solar wind is equal to the opposing pressure of interstellar wind. The Solar System is located within one of the outer arms of the Milky Way, which contains about 200 billion stars.